Learn Italian in Venice before leaving for home, is one of the experiences to do before you finish your holiday in Italy. Is possible to know yourself while you attend Classes of Italian in Venice? Learning a language is a real journey to self-discovery. Your ability to express yourself will increase and the Italian language, learn the meaning of the gestures used by Italians so, will help you make friends and to express yourself during your vacation in Italy. Keeping mental agility and learning throughout life, can be done? People who have already achieved its goals and are delighted for their work, feel the need to continue to test your mind with new challenges. And learn languages at school of Italian in Venice is a great way to do it. How challenging it is and what it offers the Italian school in Venice? It is very simple to learn this language and the Italian in Venice offers Italian individual lessons, group lessons of italian language, pronunciation lessons for opera singers, cooking lessons of italian dishes, Italian lessons on boat, touring the beautiful Venetian lagoon, and tastings of italian wine and “Cicchetti”, typical Venetian appetizers. 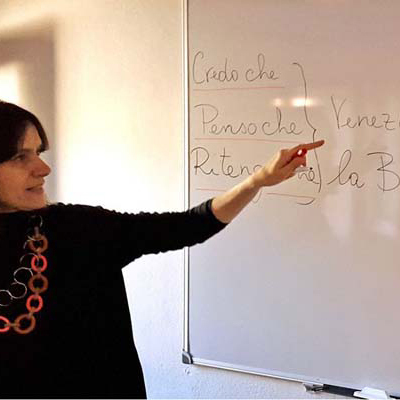 The classes of Italian in Venice are organized into weekly modules, from Monday to Friday. In just one week, you can attend Italian classes to learn the language by experiencing it!